Bootleggers and spies and gangsters, oh my! Casa Loma has never seen so much action! Toronto’s castle on the hill is all the rage since Liberty Entertainment Group took over event management of the historical landmark. Especially since partnering with Company and Co., designers of immersive game experiences, to launch the Casa Loma Escape Games Series, attracting both adventure seekers and groups on a teambuilding quest. The first, Escape from the Tower, gives players, 12 at a time, a peek of rarely seen parts of the castle as they ascend four floors set with WWII props to find and solve puzzles that get them to the top of the tower in time to transmit enemy U-boat coordinates and escape before the clock runs out. 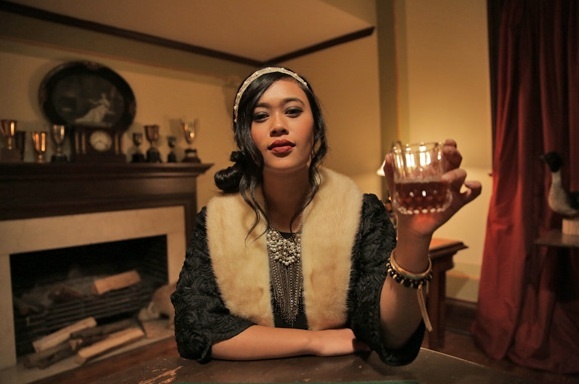 Casa Loma Escape Room GamesThe latest game, King of the Bootleggers, recently debuted with a 1920s prohibition speakeasy stage set in the castle’s tunnels. More character-driven than the tower escape game, players become part of the interactive theatre that drives them from room to room working together to help overthrow a notorious gangster. In addition to running three other escape game sites in the city, including Escape from the Time Travel Lab and Escape from the Mysterious Room, Company and Co. can custom-design large-scale games for groups over 100.